Emily’s and my new home is quickly becoming the “hang out after work” place for a lot of our friends. Maybe it has something to do with the fact that they know we will always have food? In any case, this new trend works out great; it means more taste testers! Today, in preparation for whomever might happen to show up tonight after work, I made brownies. Sweet pumpkin, rich chocolate, and creamy vanilla. What more could you possibly ask for? Except maybe a fork. Preheat oven to 330 F. Combine dry ingredients, and mix very well. Combine wet ingredients, then mix into dry. Pour into a greased 8-inch pan. Cook for about 23 minutes. 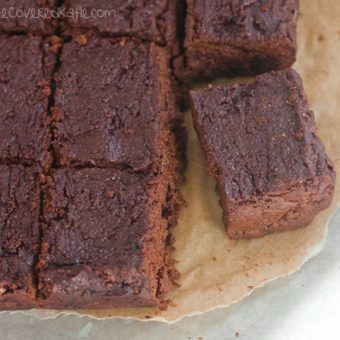 I’m not sure why this is the case, but these brownies seem to taste ten times sweeter if you don’t eat them for at least two hours after they come out of the oven! Emily and I have been alone in the house with the brownies all day. I’m afraid there might not be any left by the time my friends arrive. Poor friends; I told them there’d be brownies. What about: My little brother came by with his entire football team, and they ate all the brownies before I got a chance to stop them. That’s a good excuse, right? Only, I don’t have a little brother. Does someone want to lend me a little brother? I promise I’ll give him back! P.S. My leftover pumpkin will be used for this: Homemade Pumpkin Pie Breakfast Cereal. It’s still one of my favorite breakfasts! 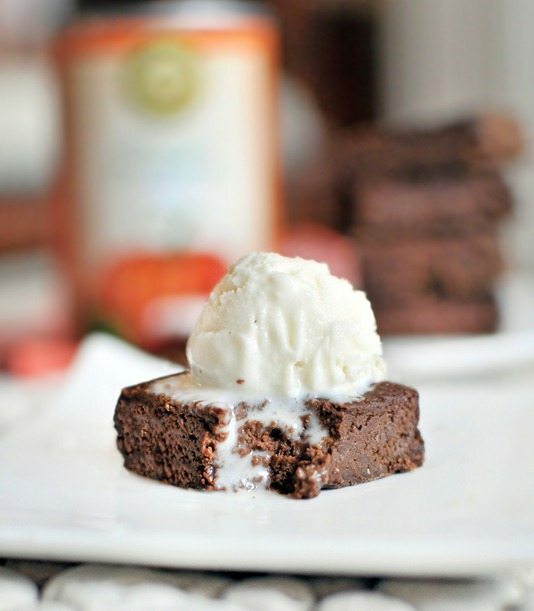 Loved your chocolate cake for one recipe – I’m sure these are just as good! 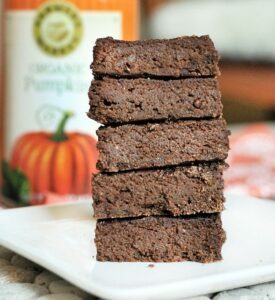 A good excuse: There was a knock on the door, the fragrant smell of pumpkin pie brownies wafting out the door attracted the notice of others and they needed a sample – and you had to help them out! Oh my. Methinks I’ll be making these once I’m home! Thanks again for the awesome guest post today! It looks so great! You can have my little brother! We can share 🙂 These photos are one of your best yet!!!!! Gorgeous! Thanks again for the awesome guest post today…looks SO great! Delish! ….I’m going to pin this and make it this weekend! 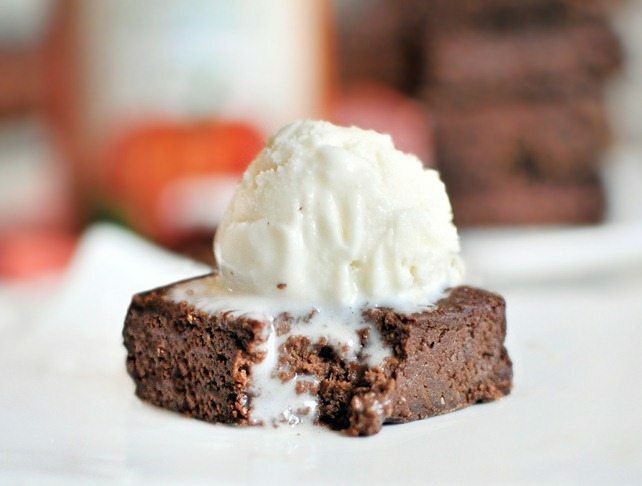 Oh those look so dense and fudgy! You don’t need an excuse Katie, be proud you make such awesome brownies! 🙂 Thanks for the recipe! katie those look so yummmy! you always make me drool over my keyboard! I have two little brothers! You can borrow them! 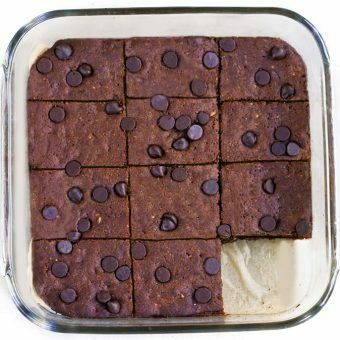 They’d probably eat two batches of your brownies! Haha two brothers… that might just work ;). The trick is to make it look like you haven’t had any to begin with! Don’t cut out a square, shave off a thin slice from the whole, straight across. No one will notice. YES! I am so excited you created this recipe! 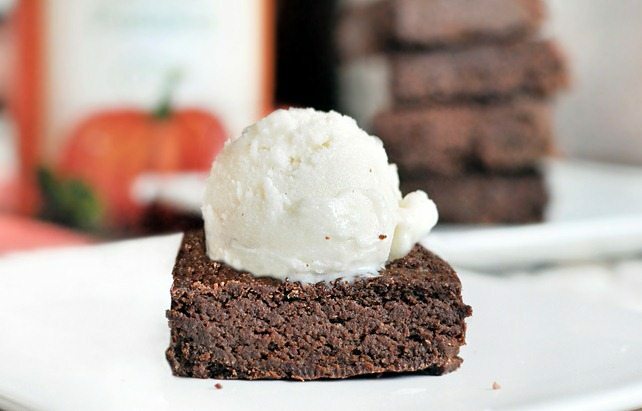 I always gawked at Isa’s pumpkin pie brownie recipe, but it is loaded with sugar. I love this pumpkin theme you are on! Haha sounds good! You had me at chocolate! 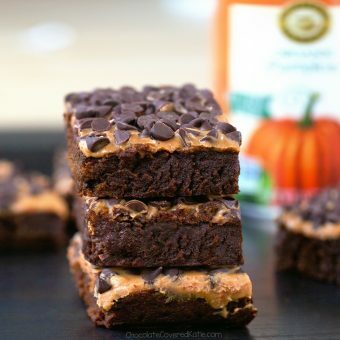 Anything chocolate and pumpkin is yummy! Happy long weekend! 🙂 These are the perfect food for a winter get together….must make plans then. You can borrow my little brother. Except he’s in the 6th grade and not on the football team yet. Lucky friends you have! And these look so moist which I LOVE- no cakey brownies for me! OK, that’s it: I’m flying down to visit my brother & family in Houston, then I’m taking their car & coming to your place for a visit! Easy! Just say you burned them. Once you say the “B” word, no one will question you further – works like a charm! i made coffee muffins today~! Yum! Pumpkin! Any member of the squash family is an any time of year favorite of mine! Haha too bad Batman still lives at my parents’ house. But he DID manage to eat a chocolate cookie once when we first got him… and he was perfectly fine afterwards! Just maybe a little extra energetic!